Our select network of high-performance service departments has pledged their allegiance to the customer experience. This means more uptime for your business and better value for your truck repairs and maintenance. In our ongoing effort to drive uptime and unmatched service to our customers, International Truck, IC Bus and our dealer network worked together to introduce Diamond Edge Certification. 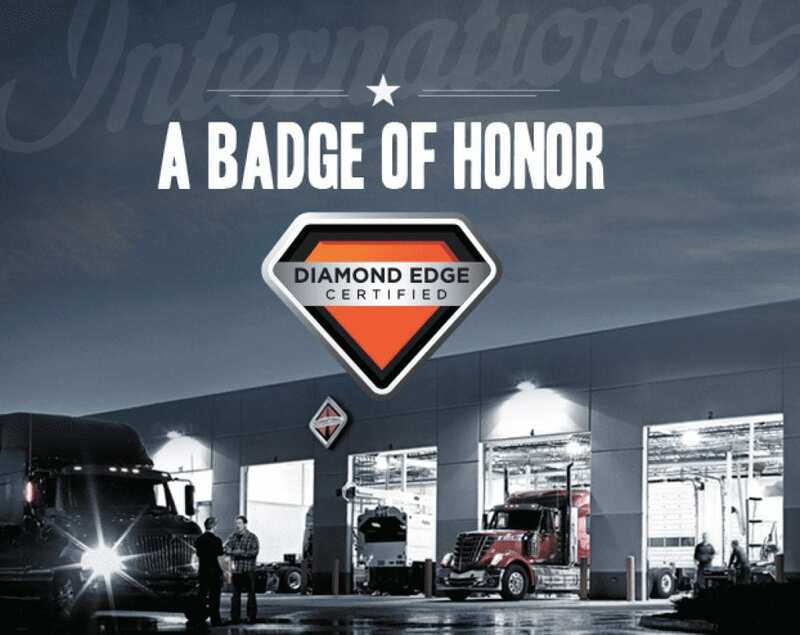 When servicing a vehicle at an International Truck or IC Bus Diamond Edge Certified Dealership, customers experience faster service, immediate parts availability and a higher level of servicing expertise. Express diagnostics (Accelerator Write-Up™) First-of-its-kind mobile application that expedites customers’ service visits by streamlining the write-up and diagnostic process. Knowledgeable technicians (Trained Workforce) Technicians, Service Advisors and service management have all met or exceed training requirements, and undergo training to stay current with changing technology and service procedures. To attain Diamond Edge certification dealers must pass rigorous parts and service guidelines, including the time it takes for a customer to get their truck diagnosed, repaired and back on the road. Certification is awarded once a dealership achieves a minimum of 4 out of 5 diamonds. Continuous Improvement – Certified dealers are expected to develop long-term actions plans that result in better service and reduced dwell time for you. Unparalleled Expertise – Extensive training completed on a routine basis ensures customers receive the highest level of service from our technicians. Technology Adoption – Our top service departments commit to adopting technology like our Accelerator Write-up App, a first-of-its-kind mobile app created to expedite service visits by streamlining the write-up and diagnostic process. Maximum Uptime – We measure our dealerships against strict benchmarks in order to minimize vehicle downtime. When a dealer acquires this diamond, it signifies they have achieved an average overall dwell time of less than 5 days for ALL vehicles serviced at this location. Repair Velocity – To be considered an elite International service department it takes a serious commitment. That’s why we measure how many warranty repairs are completed in 1 day or less. Faster repairs done right the first time, earn our dealers a diamond and our customers more uptime. Our goal is to maximize customers’ uptime and provide a best-in-class customer experience.